This week, our In Focus reviews North Carolina’s much-anticipated Prepaid Health Plan Services request for proposals (RFP), released by the Department of Health and Human Services, Division of Health Benefits on August 9, 2018, and District of Columbia’s Medicaid Managed Care RFP released on August 14, 2018. North Carolina is transitioning its Medicaid fee-for-service program to Medicaid managed care through its procurement. DC is reprocuring its managed care program, covering the District of Columbia Healthy Families Program (DCHFP), Alliance program, and the Immigrant Children’s Program (ICP). North Carolina has been working on a plan to transition 1.5 million individuals to Medicaid managed care since 2015. Following feedback from beneficiaries, clinicians, hospitals, counties, health plans, and elected officials, the state released an RFP for Prepaid Health Plans (PHPs) to provide coverage beginning in 2019, worth an estimated $6.4 billion in annual spending. PHPs, which include Commercial Plans (CPs) and Provider-Led Entities (PLEs), will integrate physical health, behavioral health, and pharmacy services for Medicaid and North Carolina Health Choice (health insurance for low-income children) beneficiaries. Proposals are due October 12, 2018, and contracts will be awarded on February 4, 2019. 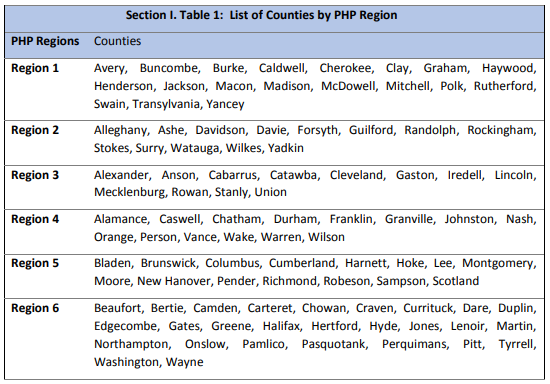 Most North Carolina Medicaid and North Carolina Health Choice populations will be mandatorily enrolled in PHPs. Individuals with a serious mental illness, a serious emotional disturbance, a severe substance use disorder, an intellectual/developmental disability, or a traumatic brain injury will be exempt until the state establishes Behavioral Health Intellectual/Developmental Disability Tailored Plans (BH I/DD Tailored Plans). These plans are expected to be operational at the start of the first State fiscal year one year after the implementation of the first contracts for Standard Benefit Plans. The RFP was released as a statewide procurement. The state has established six Medicaid Managed Care Regions, called PHP Regions. The Department will cap the number of regional contracts awarded at one (1) for each of Regions 1 and 6, and two (2) for each of Regions 2, 3, 4 and 5. Each PHP must serve a minimum of 45,000 to 50,000 lives across all regions it is awarded. To meet this requirement, the state strongly encourages PHPs to submit a bid for more than one region. Medicaid and North Carolina Health Choice beneficiaries who are not members of designated special populations will be transitioned from fee-for-service to managed care on a regional basis. The state is planning a two-phase approach with two distinct open enrollment periods to help ensure each region has an appropriate balance of enrollees, PHPs, and other considerations. Phase 1 is scheduled to begin on November 1, 2019, and Phase 2 is scheduled to begin on February 1, 2020. Following the awards, the state will announce which Regions will be selected for Phase 1 and Phase 2, depending on factors such as the number of members in the region, a goal of including urban and rural regions in Phase 1, and including a mix of commercial plans and PLEs, in Phase 1. North Carolina expects Tailored Plans to be operational at the start of the first fiscal year, one year after the implementation of the first contracts. The contracts will be effective for three years, with two additional optional years. Phase 1 contracts will begin November 1, 2019 and Phase 2 contracts will begin February 1, 2020. Contract Year 1 for both phases will run through June 30, 2020, followed by an additional two years ending June 30, 2022. The program will be worth $6.4 billion in annualized spending. The District of Columbia is reprocuring its Medicaid Managed Care Program (MMCP), worth approximately $1 billion. Managed care organizations (MCOs) will serve the Medicaid program, District of Columbia Healthy Families Program (DCHFP); Alliance program, covering low-income residents not eligible for Medicaid; and the Immigrant Children’s Program (ICP), covering low-income immigrant children not eligible for Medicaid. The RFP comes after an administrative law judge ruled in December 2017 that the District failed to treat all bidder’s equally and “undermined the integrity of the procurement process,” ordering DC to reevaluate the bids of the previous procurement. The District announced contract awards to AmeriHealth Caritas, Trusted Health Plan, and Anthem/Amerigroup in May 2017. Incumbent MedStar was not awarded a contract and filed a protest. DC expects to award up to three new contracts. Proposals are due September 13, 2018. Contracts will run from the date of award to September 30, 2019. DC may extend the contracts for four one-year option periods. The total duration of the contracts cannot exceed five years. Proposals will be scored out of a total of 112 points, consisting of technical criteria, price, and preference points. The price evaluation is objective, with the lowest price receiving the maximum score.